died on April 12, 2019, at NYE Legacy in Fremont, NE. 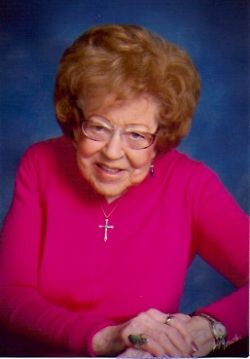 Ruth was born on August 7, 1921 near Correctionville, IA, to Fred Nelson and Ida (Leuhr) Nelson. She graduated from Waterbury High School in Waterbury, NE, where she was a cheerleader, and excelled in drawing and the arts. In later years, she took great delight in demonstrating the cheers for her granddaughters. was many things during her life – a wife, mother, friend, neighbor, and veritable bundle of energy. But most importantly, Ruth was loved, and she loved back. Fiercely. KS; grandchildren Alison Knudsen (Karen Becker) of Lincoln, NE ; Emily Ridder (Matt) of Fremont; Kristin Maier and Lucas Maier of Lincoln. great-grandchildren Makenzie and Colin Ridder, Greyson Bornemeier, and Ryker Maier. Funeral Services will be 11am, April 23, at Salem Evangelical Lutheran Church, in Fremont, NE. (401 E. Military). Visitation will be an hour before the service at the church. A lunch/reception to follow the service. Burial will be at Memorial Park, Sioux City, IA at 3pm. Memorials are suggested to Salem Lutheran Church. Ludvigsen Mortuary in Fremont is in charge of arrangements.